Santa called and this year he has a request--- no milk! This year he's going green, and by going green we mean Green Tea with Candy Cane flare. The peppermint essence mixed with the smooth aroma of green tea helps Santa through the night with his "Ho Ho Ho's". Green Tea is a metabolism booster filled with lots of antioxidants and now it leaves your breath pepper-minty fresh! Great in the morning, afternoon or evening! Call my skinny, but consider pairing Santa's Candy Cane Green Tea with a few Chocolate Covered Peppermint Jo Jo's; he's sure to leave you something nice in your stocking! The Candy Cane tea is great, too bad Trader Joe's didn't have enough again this year. 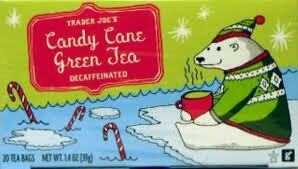 I just love the Candy Cane Green Tea. Since it goes so fast you have to believe people are loving it. Why not have it all year long.